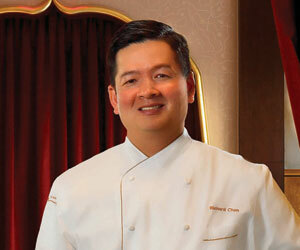 Recently TravelsinTaste.com had the distinct pleasure of chatting with Executive Chef Richard Chen of Wing Lei at Wynn Las Vegas, who discussed with us the latest culinary trends, his hobby of training dogs and his experience at the helm of the only Asian restaurant with a Michelin star in Las Vegas. If you're as curious as we were to find out what he had to say, read on. On the other hand, if you'd like to read about the meal that he created for us, please click here. Finally, you can read his biography or soon we will be placing a link here if you care to read the full listing of Wing Lei. Before we could pick Chef Chen's brain about his Strip-side career, we had to find out how he got to Vegas in the first place. "I was at the Peninsula Hotel in Chicago," he told us. "I spent 29 years in Chicago and love the city. I never even thought about coming to Vegas; I don't love to gamble. I loved Chicago and the Peninsula is a great hotel. But then the Wynn recruited me. Steve Wynn wanted me to come out here and see the property and the whole concept of the Asian restaurant. After I came out for a visit, and he showed me the hotel -- including the size of the property -- and explained the quality of what he wanted to do – everything is about quality, and that philosophy makes my job even easier -- I agreed." Of course, it helped that Steve Wynn was offering the chance to serve great food to great customers with the help of a great team. "Everyone is the on the same page here," Chef Chen says. "The bottom line is to make the customers happy. We have a lot of people who come to visit Vegas each month; they travel a long way from the east coast, sometimes even from Asia, and they want to enjoy themselves and be entertained. When it comes to food they are very particular; what they want to eat is good quality food and they don't mind spending for it. The ingredients, spices and products, they keep getting better each year here." With so many great things to offer, it's no surprise that Chef Chen couldn't name just one favorite thing about his restaurant. Instead, he told us, he loves "the whole package," including the ambiance and the people. "When Steve Wynn wants to build a hotel or restaurant he really hires the best people," he says. "And he himself takes the time and is very detailed in planning for the whole package. Walking into the restaurant is very impressive and the back of the house, equipment and work spaces for the employees were designed incredibly; they allow us to get food out on time or even faster because of the detail and thoughtful, perfectly executed plan. It's great to combine that for a successful restaurant." Ultimately, though, the experience at Wing Lei is all about the food, so we naturally wondered, where does Chef Chen find the inspiration for his extensive menu and phenomenal tasting menus? "In terms of menu inspiration, we are always searching for ways to get ingredients into Las Vegas," Chef Chen says. "Las Vegas is in the middle of the desert; for vegetables and seafood, if you go to a good Asian restaurant you'll find that this combination is the most important combination of ingredients. The selling point is that the seafood has to be live. The shellfish and the fish are all live and need to be served right away. The challenge was that we had to ensure that we had a seafood purveyor who could deliver the fish at least two times per week from California, and had to go to the ports and sometimes the airport to receive the live fish from Asia. It's very hard to come by, but for special Asian guests, anything with live seafood they will buy right away."